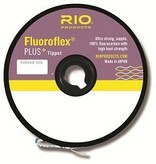 "RIO Fluoroflex Plus is an exceptional tippet material made from 100% fluorocarbon (PVDF). Fluoroflex Plus is the strongest, thinnest fluorocarbon on the market with an incredible strength. It is a slightly softer material than Fluoroflex and ties excellent knots. The refractive index (1.42) of Fluoroflex Plus in water (1.33) compared to nylon (1.62) makes it almost invisible to fish. Fluoroflex Plus, with a density of 1.72 (compared to nylon of 1.15), sinks quicker and gets below the surface tension for more effective dry fly, nymph and wet fly fishing.